Procurement shared services teams — also known as centers of excellence (CoEs) — don’t get enough respect. In larger companies, they are often critical not only to bringing greater operating efficiency to AP and P2P transaction processing but are also increasingly involved in strategic areas including market intelligence, strategic sourcing and even sourcing optimization. For a primer on CoEs, see: Procurement Centers of Excellence (CoE) — What’s in Them and How to Set Them Up (also check out the links at the bottom of this post). Many of SAP Ariba’s customers have CoEs or are in the process of building of them. But as far as we know, no source-to-pay technology provider has come out with a specific module just for them. Until now. 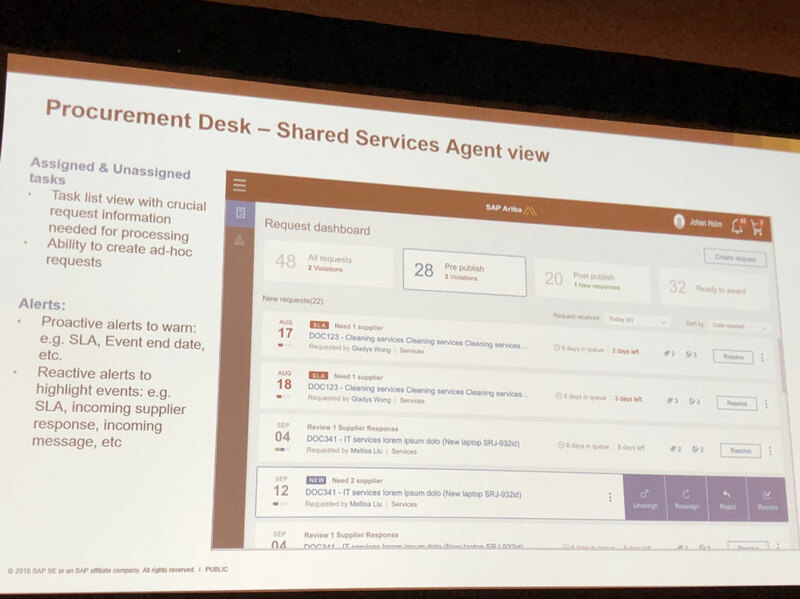 At SAP Ariba Live this year, SAP Ariba previewed its Procurement Desk offering, which is now in “limited availability” but will see a general availability release in Q2 2018. BASF was SAP Ariba’s design partner for the CoE offering. 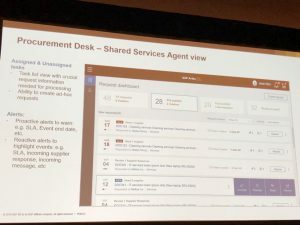 Procurement desk enables shared services team members to manage activities and tasks, including those that have been assigned/delegated and those that are unassigned. These may include adding a new supplier, managing a sourcing event request or looking at SLA adherence. Users are greeted with suggested activities and items requiring their attention based on role. The module then provides a task list view from which users can drill into a need, request or activity. It also enables collaboration directly in the application at the CoE level, as well as with procurement, business users and suppliers. It enables the ability to assign and monitor KPIs specific to a CoE (e.g., sourcing events managed). The Q2 2018 release focuses on strategic procurement activities (e.g., sourcing and supplier management). Future releases will extend to operational procurement areas and AP-centric activities in the quarters to come. Stay tuned for a Spend Matters PRO analysis of SAP Ariba Procurement Desk in the coming week. Curious about how SAP Ariba performs relative to peers on a comparative solution basis in the spend analytics, sourcing, supplier management, contract management, e-procurement and invoice-to-pay areas individually or together — and how the network supports these solutions? Check out Spend Matters Q4 2017 SolutionMap. Based on more than 35 technology vendor participants, 750 functional benchmarks and 350 customer peer reviews, SolutionMap offers a persona-driven view of of procurement technology solutions. Updated quarterly, the Spend Matters Q1 2018 SolutionMap update will be released in March 2018. What is Market Intelligence, and is it Relevant to Procurement?